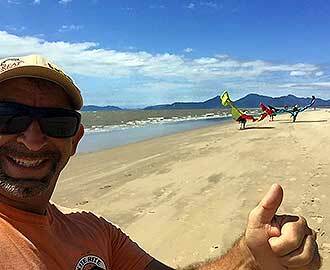 Kite Rite Australia is 100% locally owned and operated by Cairns kiting enthusiast Chris Rose. The business was started in 2000 with a simple vision, to share his passion and knowledge of all things kite surfing with his peers and those wanting to learn more about the sport. Chris has always been a true waterman. Growing up in Western Australia, he was an avid wind surfer and spent much of his working life island hopping as a watersports instructor. As well as teaching novices how to waterski and sail, Chris also spent a few years at Airlie Beach working as a bowman on the maxi Raggamuffin. Chris loved his time in the water and loved teaching, so when a new and lighter wind alternative evolved, he was all over it. In 1998 Chris bought one of Australia’s first marine wings; a foil on handles with back strap and surf board. There was one big problem with this purchase, there was no one who could teach him how to use it, and the only footage he had ever seen was of Cory Rossler on waterskis on television. As you can imagine, those first few days of learning were an absolute nightmare! That is why and when Chris developed the Kite Rite teaching system. Once he had learned to master the kite and developed his own system of teaching, Chris augmented his skills with an International Kite Surfing Organisation [IKO] course. Not long after that, the water relaunchable kites came into production and Chris was keen to start his own kite surfing business. Scouring Australia’s coast, Chris found Cairns, and to be more precise, Yorkeys Knob, in Tropical North Queensland. Receiving constant south-easterly trade winds from April to October, Yorkeys Knob was the perfect place for Chris’ new business, Kite Rite, to start. Today, 16 years later, Kite Rite has established itself as Australia’s premier Kite Surfing company. 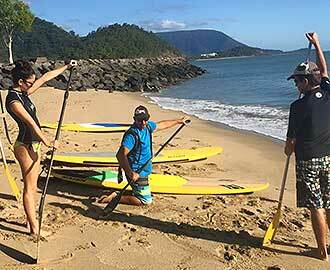 Kite Rite also does Cairns SUP! It’s a natural extension of our kite boarding expertise and just another great way to get you out on the water, having fun. Lessons and equipment. Cairns kite surfing lessons with instructors certified by the International Kiteboarding Organisation. 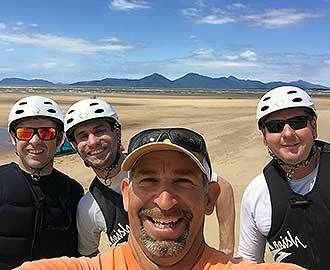 Have proudly taught over 3,000 people to kite surf, safely and professionally. Stocking a complete range of kite boarding and SUP equipment from NAISH, NORTH and FANATIC. Available for sale or hire. Can try before you buy, booking a lesson with our equipment.